What a great post this was for someone that doesn't even have a stick burner. I'm going to apply this fire management to my Pitmaker Safe and see how it works. Many times I've turned to using my Yoder YS640 pellet grill for its ease of use but I do believe some great food comes from a pit burning a good clean fire. Love my pellet grill but really looking forward to trying my Safe after reading this very informative post. Great forum Yoder! I have gone through this post, combing for clues (love the vid, btw). I kicked up my Cheyenne twice this weekend for my first two cooks. I followed the suggestion of a chimney full of lump prelit then adding split every 45 mins or so based on how much the previous burnt up. I had placed in the main chamber a water pan, something like you’d cook banana bread in, between the fire box and the meat. I placed my digital thermometer between the meat and the water pan. I was cooking chicken and ribs and I had placed the chicken on the hot side for a crisper skin. My digital thermometer keeps a graph of the cook temp vs time… and it pretty much looked like a wicked mountain range, anywhere from 250 to 500. I am trying to learn how to lower my spikes and get a more consistent cook, with the understanding there will be some spikes. I did not have my HMP in during this cook, would having it in all the time give a more consistent cook? It was a very windy day as well… and I am assuming that played a key role in this as well. What is the best way to combat wind? I am assuming of all the elements for the stick burners this is the worst aside of a monsoon or blizzard. I could possibly rotate the smoker, but where it’s at now is in kind of a weird spot where wind blows in from different directions. Any suggestions? Thanks. You said what I do, move the intake to where wind is less of a factor. If you have ongoing varying wind speeds, it's going to be a little more work. I've even gone as far as placed metal trash can or some sort of object a few feet away from the firebox intake to help divert some of the wind away from the intake after I have rotated the pit. Wind swirls in my cooking area, so I really can't avoid it all together. Plus I live in a windy region. Some of it will just take learning and experience. A smaller pit is more susceptible to temp swings than a larger one since there is less thermal mass from the pit, so that is just the nature of the best to a certain extent. But your swings shouldn't be that wild. Another thing to do is if it is windy, I'd heat the pit up 50 degrees or so above your cooking temp and let it sit there for an hour or two first so the steel is evenly heated and will help the swings be less of an issue. Also, do NOT open the pit door unless absolutely necessary. No peaking is a big deal here. Make sure to feed the wood in the side door of the firebox instead of the top door. Less heat will escape and therefore less swing. This isn't always an option for everyone, but if you have an accessible detached building on your residence, you can use that as well to a certain degree. 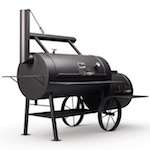 My garage is detached, so if the wind is just too much to deal with, I will put the firebox side into the garage and make sure the stack side is out so the smoke can exhaust out of not into the structure. If your garage is attached, DO NOT DO THIS!!! Carbon monoxide is not your or your family's friend. Also make sure the it won't change the level of the cooker allowing grease to flow toward the fire. That is a big problem waiting to happen as well. Wind is an issue, absolutely. In addition to the changing the amount of O2 that goes into the intake stoking the fire, it pulls the heat away from the cooker cooling the metal as well. All around it can be a pain in the neck and swings are just going to happen. 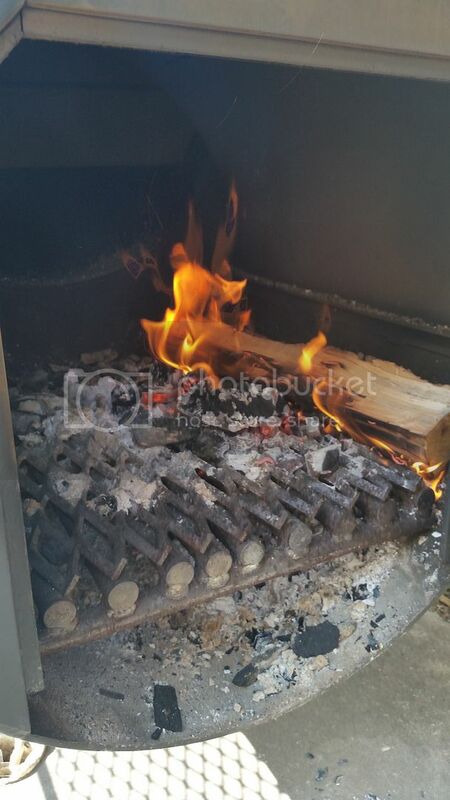 However, experience with the pit and learning a technique and save pit placement that works for you will be the biggest key to reducing the swings to a little more than a normal stickburner temp swing. Hope this gives you some ideas to apply to your individual use. 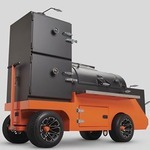 Yoder_Kirby: Which cooker is that in your demo, and does it have an insulated firebox? That is a Kingman comp cart. No insulated firebox. The Kingman comp cart has been replaced by the Cimarron, which does have an insulated firebox.